Infinite play-ability in endurance mode, or play story mode. An underwater shoot 'em up, that is family friendly and a little campy, featuring a whale (Corbin) with a laser strapped to it's back. You'll also see sharks with lasers, turtles with rockets, and much much more. The updates to the animations have continued. The Sea Turtle has come together really well. It is a dramatic change from the original turtle to what will be in the game. It will have three sets of animations making them do a few different things while idle in the ocean getting shot at by lasers. Here is an animation showing the old turtles in the game. The new turtles jump out with color and have a ton more personality than the old ones. Check them out. That shows off two of the animations which are subtle but add variety to the sea creatures. We are adding one more animation making the turtles eyes open and close. Then it will be on to the poor neglected jelly fish. Here is another sneak peek at the turtles as the first level, open ocean, comes together. Happy new year all of you! I hope this year brings a lot of fun from Afterthought Games and look forward to bringing some cool things to all of you. We have been working on getting some new animations into Cornflower Corbin and have gotten our first creature completed in the game so far. 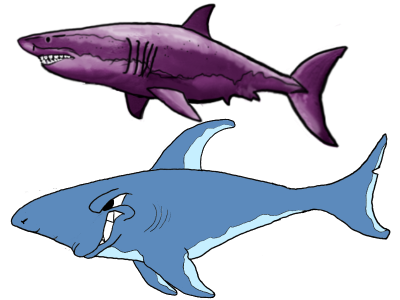 Here is a preview of the shark animated by hand and looking good in the game. You can see three full animations smoothly at play with the blue shark swimming through the center of the screen. It starts with hunting the player once it finds them it flips to a long sweeping tail flip and scrunches its face. At that point it begins to swim fast with quick smaller tail swings and charges the player. To finish this off We will be adding the shark opening its mouth if the player is close. This should add some great smooth action for the creature and make the sharks actually entertain instead of how they used to look. Here is a comparison image of the old to the new look. The old look was good, but was very hard to animate and looked a mix of realistic and fake that just seemed to have less character. We look forward to seeing how the entire game looks and feels as we transition to the full hand animated look and feel. As all the creatures get done and we keep adding animations this game should take on the character we always wanted it to have. Let us know what you think and stay tuned. Up next the sea turtle will be getting its fun new animations and look to join the shark. Once the first level is complete we will be updating the game and you will be able to play with the newly animated creatures. Thanks for all your support and we cannot wait to hear what you think of the changes.